Missing singing the traditional carols? 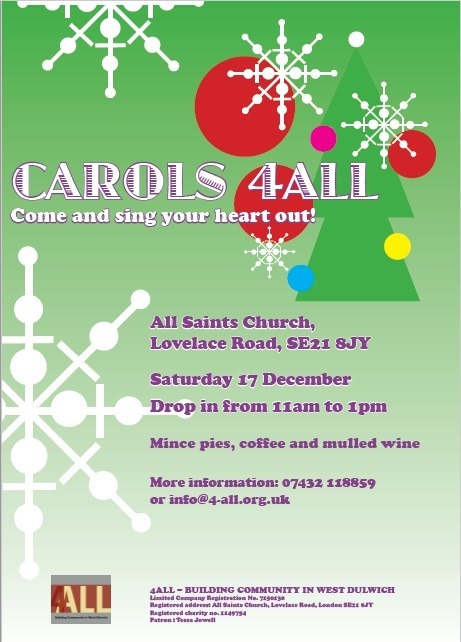 Drop in to Carols 4ALL at All Saints Church, Lovelace Road, West Dulwich and sing all the old favourites – plus mince pies, punch and tea and coffee. Saturday 17 December from 11.00 to 13.00. Come whenever you want and stay for as long as you like. Posted on December 6, 2016 by thurlowparklabourTagged 4all, All Saints, All Saints Church, Carols, community. Previous Previous post: Welcome to the People’s Fridge!